When I was a young boy, I loved to color with my big box of Crayola Crayons. I would pull out blank sheets of paper and create multi-colored masterpieces (at least my mother said so). A creative dataviz type who goes by the name Velociraptor (referred from here as “Velo”) created the chart below to show the historical crayonology (I just made that word up!) of Crayola Crayons colors. Velo gently scraped Wikipedia’s list of Crayola colors, corrected a few hues, and added the standard 16-count School Crayon box available in 1935. Except for the dayglow-ski-jacket-inspired burst of neon magentas at the end of the ’80s, the official color set has remained remarkably faithful to its roots! 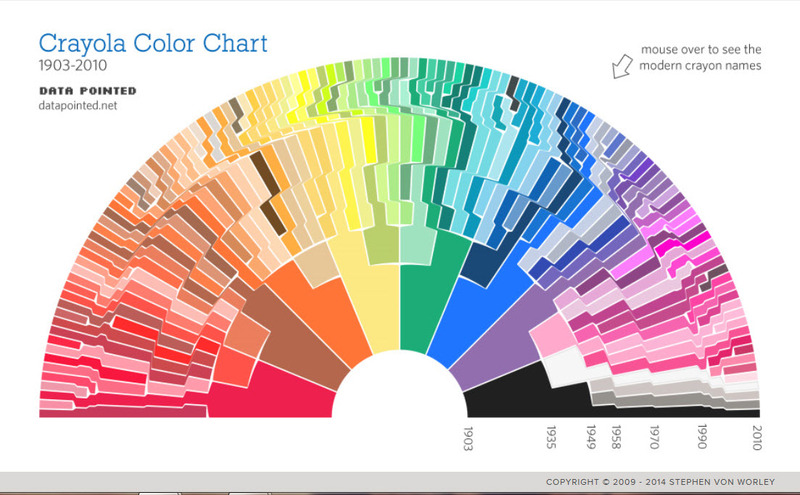 The number of colors doubles every 28 years! 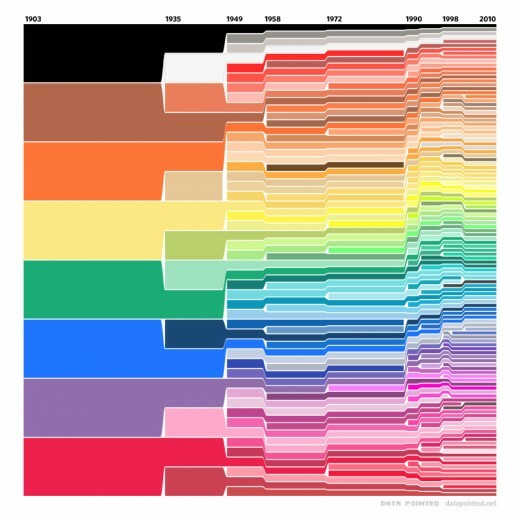 Stephen Von Worley, Color Me A Dinosaur, The History of Crayola Crayons, Charted, Data Pointed, January 15, 2010, http://www.datapointed.net/2010/01/crayola-crayon-color-chart/. Stephen Von Worley, Somewhere Over The Crayon-Bow, A Cheerier Crayola Color Chronology, Data Pointed, October 14, 2010, http://www.datapointed.net/2010/10/crayola-color-chart-rainbow-style/.